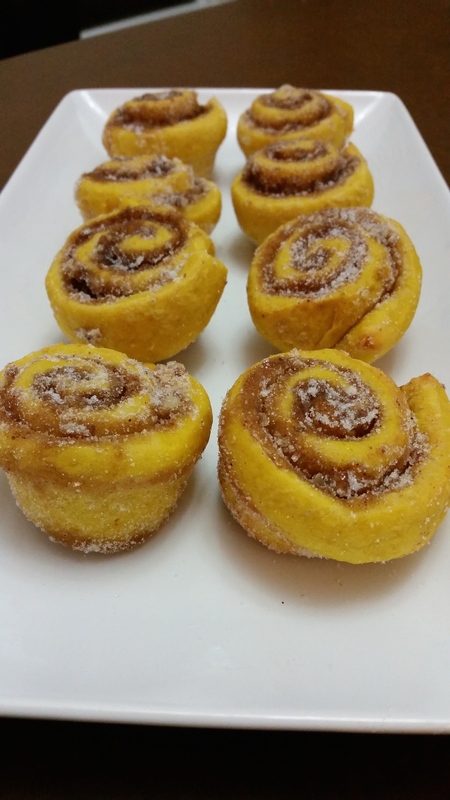 Pumpkin Pie or cinnamon rolls? Why not both? 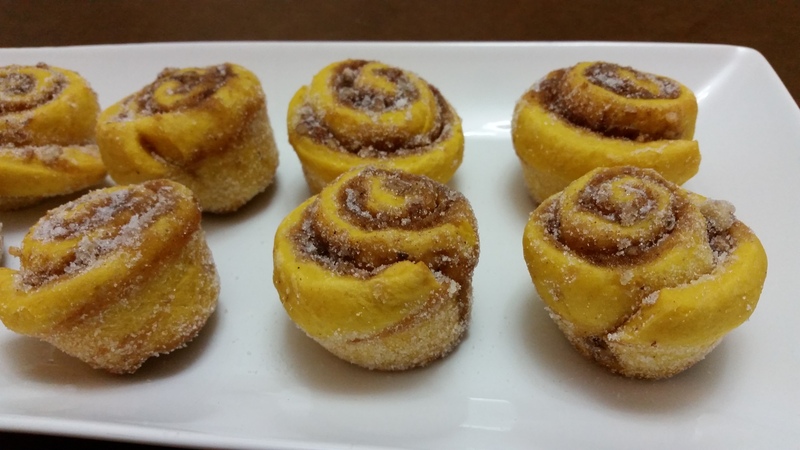 These sticky little buns are the perfect seasonal bite. 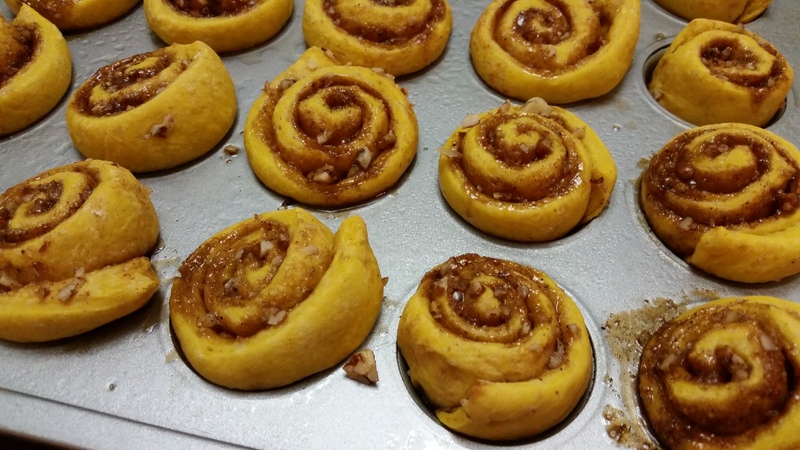 Pumpkin puree is incorporated throughout the dough and a delicious mix of nuts, brown sugar, and pumpkin pie spice is rolled into the buns. Logs of delicious pumpkin wonderfulness are slices into bite-sized pieces. 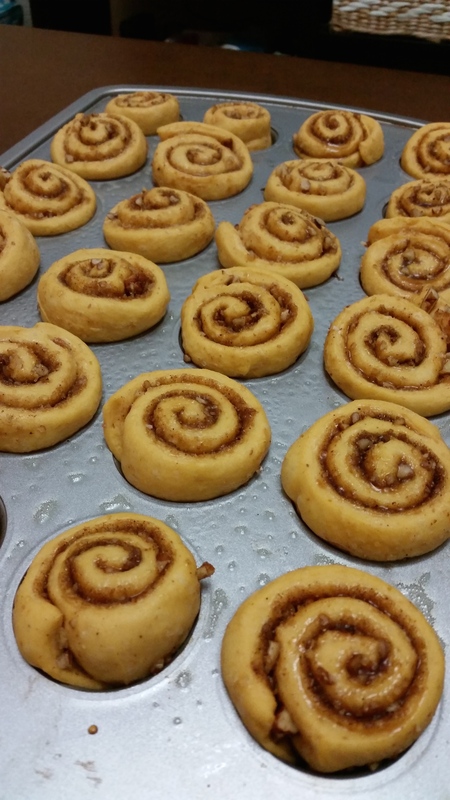 Look at those gorgeous swirls! The little rolls fit perfectly into mini muffin pans. 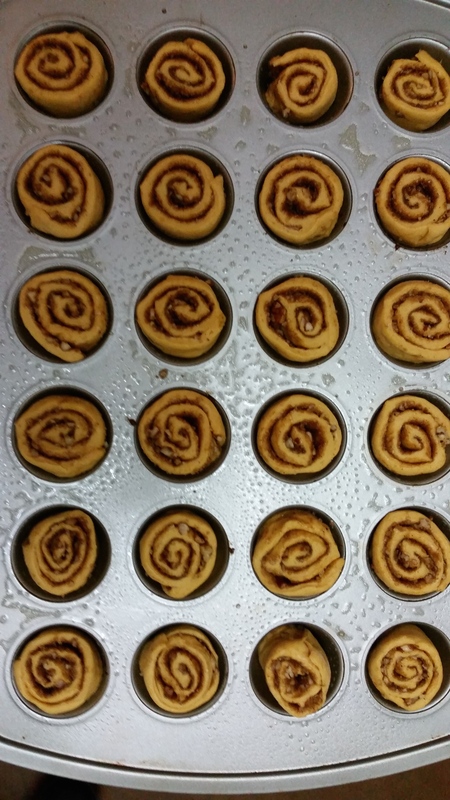 They get some time to rise for the second time before baking. They puff up beautifully! Quick! 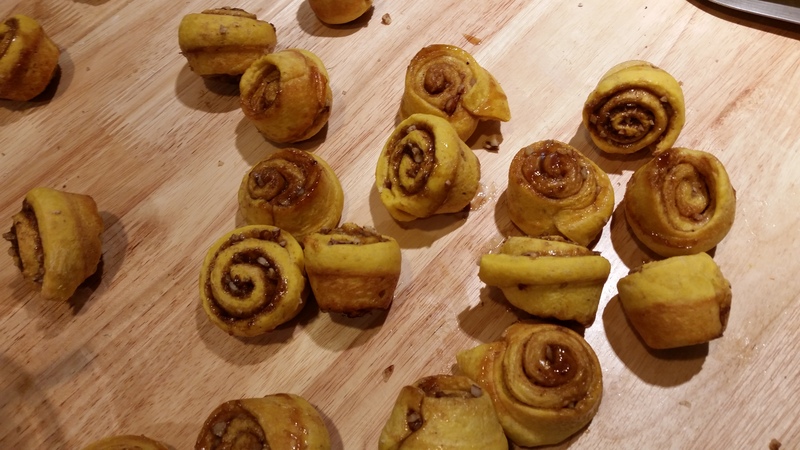 Before they have a chance to cool, dump the buns out onto the counter. Mine released from the pan easily–make sure you’ve thoroughly greased your muffin tin! Dunk ’em in sugar while they’re nice and warm so the sugar will stick. I’ve been told that bringing afresh batch of these to your morning Torts class will make you the most popular law student on the block. Warm, sticky, but not too messy to toss in a tupperware and share. Plus, they’re so tiny you can easily have one for breakfast, one for brunch, and another for dessert. Makes 36 mini pumpkin rolls. 1. 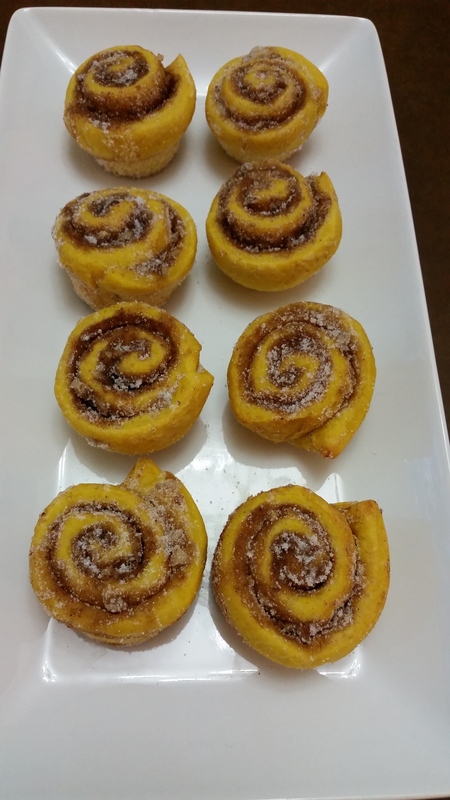 In a bowl, combine 1-1/2 cups flour and yeast; set aside. 2. In a saucepan, heat and stir pumpkin, milk, sugar, 2 tablespoons butter and salt until warm and butter is melted. Add to flour/yeast mixture. Stir, add the egg. 3. Beat on low speed for 30 seconds, then on high speed for 3 minutes, adding enough flour as necessary to make the dough form a ball of soft dough. Knead until smooth and elastic and no longer sticky. Place in an oiled bowl, cover and let rise in a warm place until doubled (about an hour). 4. Divide dough in half. Roll into 2 rectangles, each about 18″x12″. 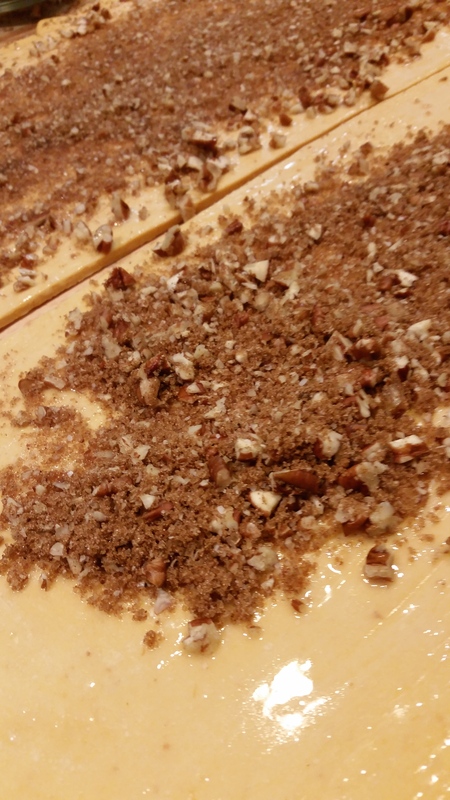 Get the dough fairly then, then melt remaining butter and brush evenly on dough. Combine brown sugar, nuts if desired, and spices. Sprinkle over dough. 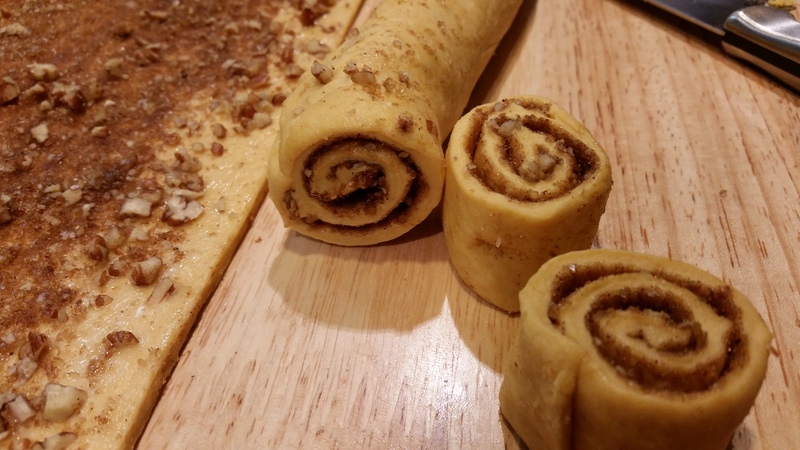 Roll dough, jelly roll style, starting with the longer side until you have a big log. Cut into one inch pieces, about 18 small rounds per roll. 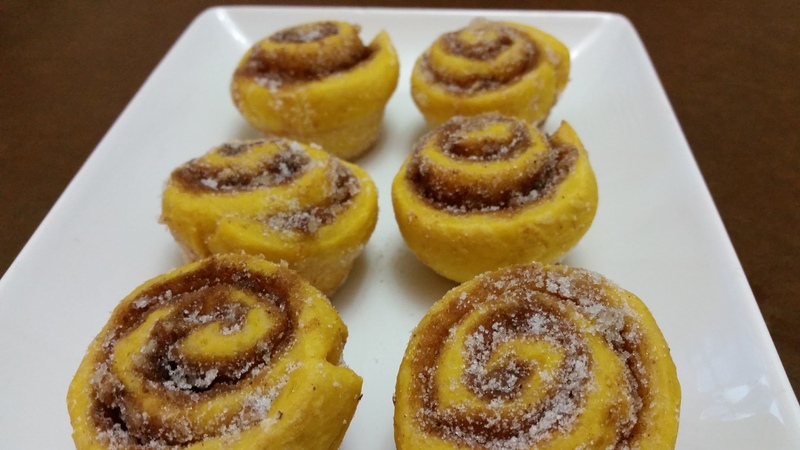 Spray mini muffin tins with vegetable oil and place each roll in a mini muffin cup. 5. Cover loosely with saran wrap or a dish towel and let rise until doubled, about 30 minutes. Bake at 375° for 15-20 minutes or until puffed and golden. 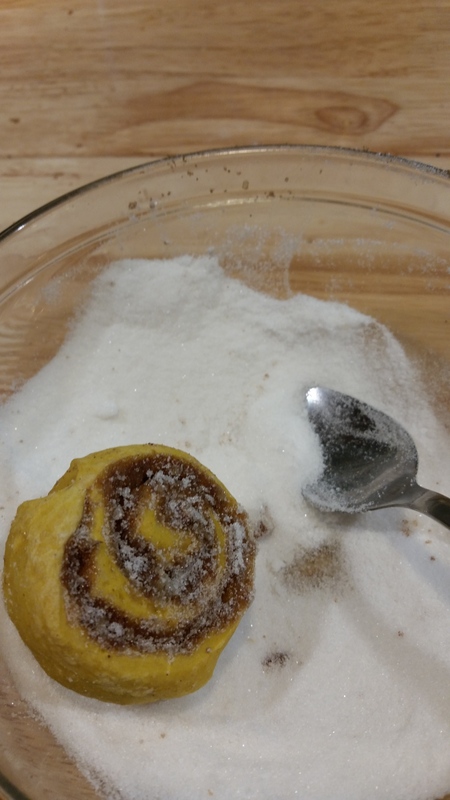 Place 1/2 cup granulated sugar in a medium bowl and, while the rolls are hot, toss them in the bowl to coat. Caramel Apple Bars – Easier than Pie!